Ⓟ 1977 & Ⓒ 1978 The Decca Record Company Limited, London. Made in England (sleeve & labels). Back: C.P.E. Bach - engraving by J.F. Schröter, By kind permission of The Royal Society of Musicians of Great Britain. Sleeve printed in England by Robert Stace. Comes in a blue printed (Decca) company inner sleeve. A separate 2-page insert leaflet contains notes on the works performed in English, French and German. The leaflet is printed by Senol Printing Limited. 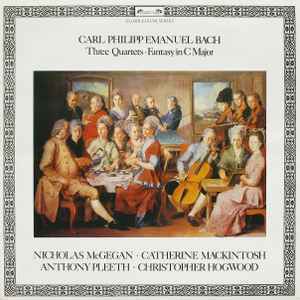 I have to second the_retrobaron: this is one of the most realistic sounding recordings of chamber music that I know of. A true gem that puts most of the 'audiophile' blockbusters to shame. A magnificent disc! What a stunning recording this is! It's like the players are in your room..
Also great playing of this very delightfull and rare to find music from CPE. Was to sell it, but it's not leaving my home!